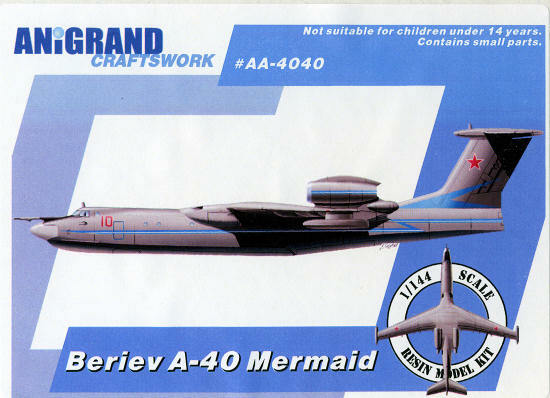 The Beriev A-40 Al'batros ("Albatross", NATO reporting name: Mermaid) was a jet-engined amphibious flying boat designed by the Beriev Aircraft Company for the anti-submarine warfare role. Intended as a replacement for the Beriev Be-12 amphibian and the land-based Ilyushin Il-38, the project was suspended after only two prototypes had been manufactured, due to the break up of the Soviet Union. Recent reports suggest the project has been revived and that an order has been placed by the Russian Navy. The maiden flight was unplanned; during a high-speed taxi test, the airplane become airborne and ran out of runway, with the crew being forced to continue the takeoff. The subsequent flight and landing went without further incident, but the test crew were downgraded from their duties afterwards despite having saved the aircraft. On 05 September 2008 the deputy commander of Russian Naval Aviation, Maj.Gen. Nikolai Kuklev, announced that the A-42 is to be adopted as a main SAR and antisubmarine aircraft of the Russian Navy, and a provisional contract for 4 SAR-outfitted aircraft has been awarded to the company, with deliveries to start in 2010. All four aircraft are expected to be in service by 2013. A large contract for hundreds of recon and ASW variants to replace the aging fleet of Be-12 and Il-38 aircraft is under consideration. Anigrand's kit of the A-40 is all we have come to expect from this Hong Kong kit company. The molding is very good with practically none of the usual minor molding glitches that one has seen in their older kits. The only thing I found was a tiny bit of flash and a broken wing tip pod. This may well have been due to the size of the box, which unlike previous kits, has plenty of room for the polybagged parts to bang around. Perhaps spending a few cents on some tissue to help cushion things would be in order. Thanks to the lack of fiddly bits, construction of the A-40 should go quite quickly. Though the instructions are moot on the subject, it may be a good idea to put some weight in the nose of this one. Like all recent Anigrand kits, it comes with resin clear parts and my experience with these has been very good. Also in line with other 1/144 kits, it comes with a multiple of other aircraft. In this case a SAM-29 flying wing (of which I know nothing), a Beriev R-1, the first turbojet powered sea plane, and the Ka-29 'Helix', which is the current standard ship-board helo for the Russian Navy. There are enough markings to do one of each of the aircraft. The instructions have two CAD drawings of each aircraft type while on the other side of the sheet are painting and markings info. The Internet would be an excellent place to go for actual photos of most of these, and that will help with painting and details. Yet another group of interesting kits from Anigrand. I can guarantee you that some of these won't be found anywhere else, and if you like big aircraft or are challenged for shelf space, there are ones you should seriously consider. Thanks to www.nostalgicplastic.com for the preview kit. Get yours today and pay no shipping in the US or Canada.